Hello! Welcome to the all new The Beginning Writer site! I am so excited to be back! I have worked long and hard to bring you the best site and the best help that I can give you. Along with the new site design, starting today, you will find new articles here every Wednesday. If you sign up for my email list, you'll get an email from me on Fridays full of links to other blogger's articles that are helpful to beginning writers. So let's get started! 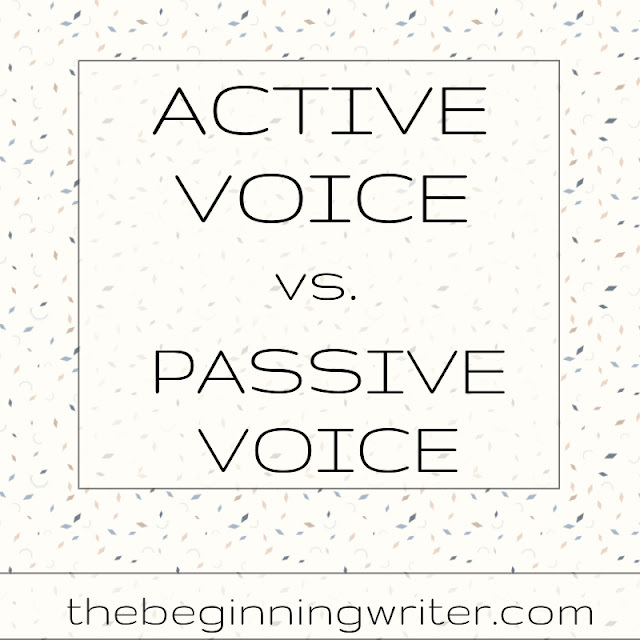 This week I'd like to talk about something that I've only recently learned about: the difference between the active voice and the passive voice. 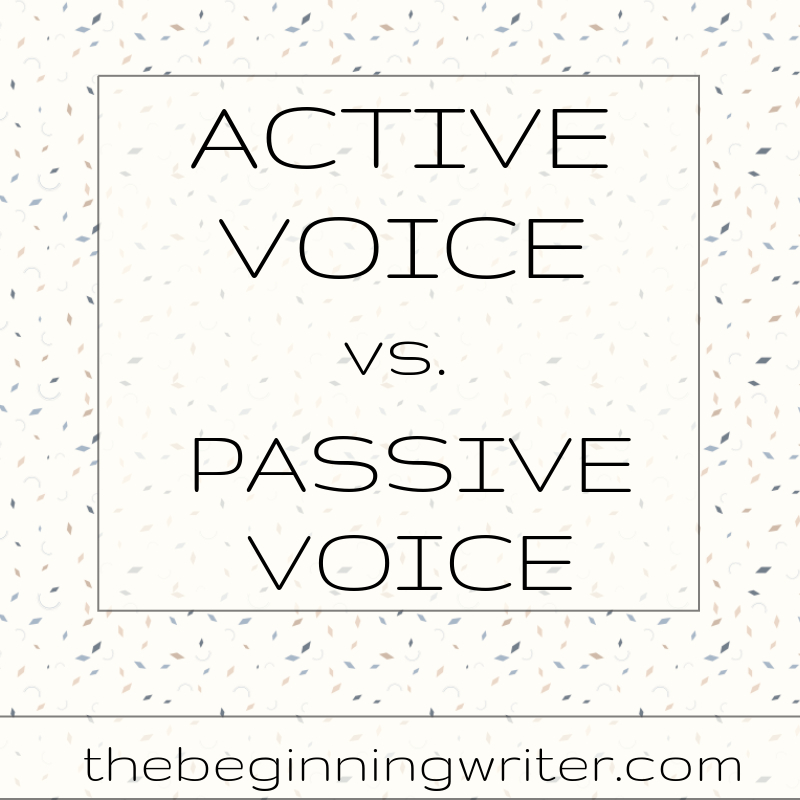 It turns out that verbs come in two types, the active and the passive. With an active verb, the subject of the sentence is doing something. With a passive verb, something is being done to the subject of the sentence. "Writing in the active voice makes writing more vivid, convincing, and confident. Active voice also helps you avoid unnecessary redundancy and awkward phrasing because active voice is more direct. Passive voice tends to lead to generalizations, and sentences and descriptions that lack specificity. That's not to say that passive voice has no place in your fiction, and certainly is not realistic, or possible, to eliminate all uses of the passive voice. However, good fiction writers pay attention to the difference between active and passive voice and, when the can, strive for the former rather than the latter." How about this: My first kiss will always be recalled by me as how my romance with Shayna was begun. Oh man! Who farted, right? A simpler way to express this idea might be this: My romance with Shayna began with our first kiss. I'll never forget it. You might also notice how much simpler the thought is to understand when it is broken up into two thoughts. Here's a little trick I found to help you recognize which voice you're using. Isn't that great? I love it! 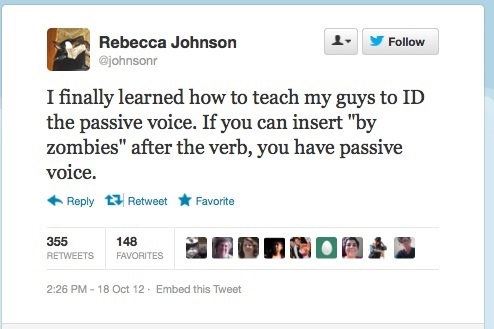 So if you can add the phrase, "by zombies" after the verb, and it makes sense, the sentence is passive. If it doesn't make sense, it's active. The two kings are signing the treaty. The treaty is being signed by the two kings. The two kings are signing by zombies. The treaty is being signed by zombies. The one that makes sense is passive. What do you guys think? Did you already know about the active and passive voice? Does this little trick help?